As we vault over the end of February into March, there are a few shows which made the leap with us. And after that, plenty of shows to keep March roaring like a lion all the way to the end of the month. 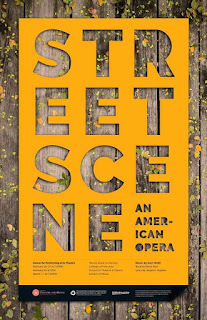 Illinois State University continues its production of Street Scene, an opera version of the Elmer Rice play about the denizens of a tenement on a hot day in New York City, with the action shifted to 1946. Kurt Weill wrote the music, with poet Langston Hughes providing the lyrics for this look at the overlapping lives of ordinary working people of different ethnicities and clashing personalities. 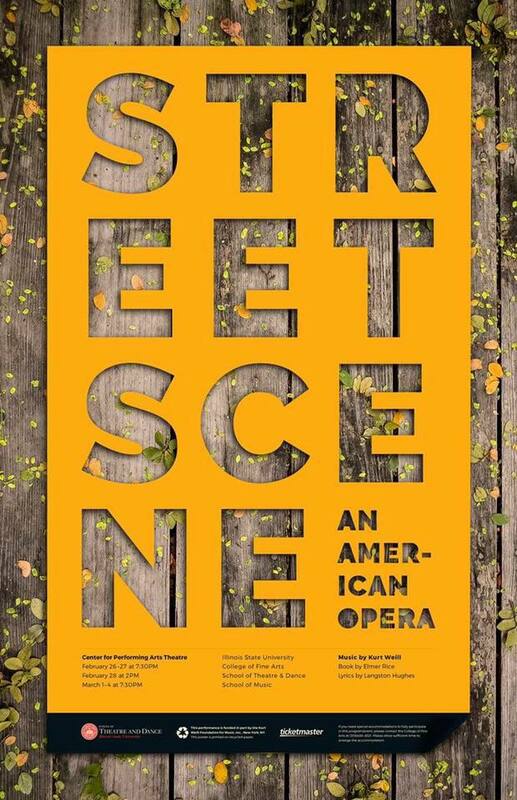 Street Scene opened last week, but there are four performances left this week. You have a choice of tonight, Wednesday, Thursday or Friday at 7:30 pm at the ISU Center for the Performing Arts. 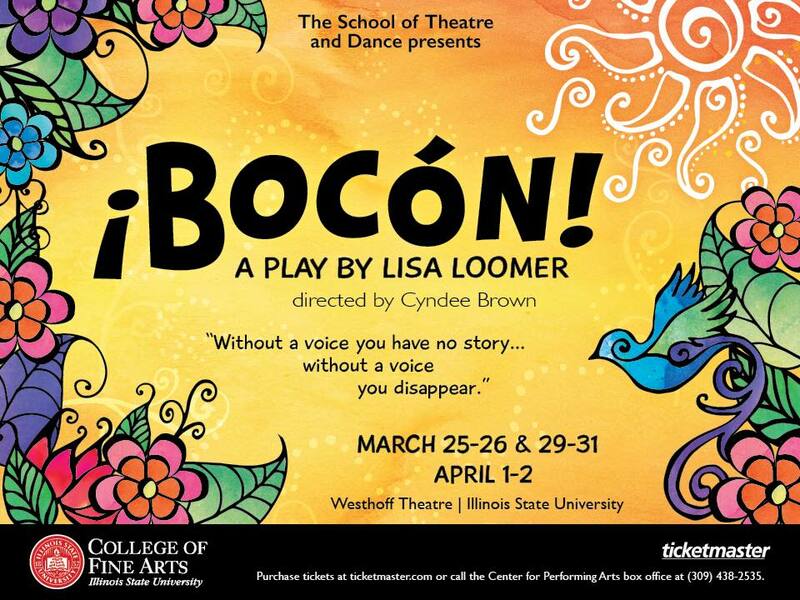 Click here for more information on upcoming ISU productions or here for ticket info. Also continuing this week is Dead Guy, a darkly funny play about the dangers of reality television written by Eric Coble, on stage at Illinois Central College in East Peoria. You can tune in to Dead Guy March 4, 5 and 6 at the ICC Performing Arts Center. Eurydice opens tomorrow night at Eureka College, with performances through the weekend. This surreal, lyrical Sarah Ruhl play takes a different look at the myth of Orpheus, putting Eurydice in the center of the story. Instead of a look at a man who ventures into Hell to find his bride, Ruhl's play takes us along with Eurydice, the woman who dies on her wedding day, as she acclimates to a new world -- the world of the dead -- and how she reacts when her groom comes in search of her. 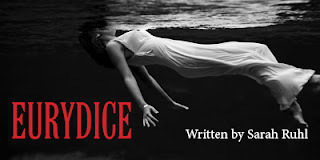 Click here for more information on Eurydice in Eureka's Pritchard Theatre. You'll find the funny science fiction/horror musical Little Shop of Horrors playing at Community Players in Bloomington from March 11 to 26. The sci-fi and horror come in the form of a "mean green mother from outer space," a bloodthirsty plant known as Audrey II. Little Shop started as a super-cheap black-and-white movie supposedly made in two days by legendary director Roger Corman, with Jack Nicholson in a small role as a dental patient who loves to feel pain. That cult classic spawned an off-off-Broadway musical (that quickly moved off-Broadway and eventually got to Broadway) with music and lyrics by Alan Menken and Howard Ashman. The stage musical was turned into a bigger-budget* movie with Rick Moranis and Steve Martin in the cast, along with Ellen Greene, who'd played Audrey I when the show was off-off and off-Broadway. For Community Players, Chris Terven plays Seymour, the lowly floral shop clerk who loves a girl named Audrey (Aimee Kerber) from afar and raises Audrey II (voice by George Jackson III) from a sprout into a giant green monster. For more information on all things Little Shop at Community Players, click here. If you've enjoyed Sticky in the Sticks -- pop-up theater in the form of ten-minute plays set in and performed at a bar -- you'll want to make sure you get to the newest edition, Spring Sticky on March 11. As always, Sticky plays at the Firehouse Pizza and Pub in Normal. This time out, you'll see actors like Connie Blick and J. Michael Grey, co-founders of the B-N "in the Sticks" version of Sticky, along with Ben Gorski, Kari Knowlton, Anthony Loster, Wes Melton, Joshua Miranda, Nancy Nickerson, Terry Noel, Keaton Richard, Jared Sanders, Maureen Steerenburg, Cathy Sutliff and Lucian Winner. Plays performed include work by local author Terri Ryburn and Libby Emmons, Sticky's original New York founder. Admission is $8 for everyone -- you don't have to be over 21 to get in, but you should be aware that the material performed may have mature themes and language. The show will begin at 8 pm, with local folk/blues duo River Salt as the opening act. Be advised to be there early to get a good seat, since the space in the bar is limited. 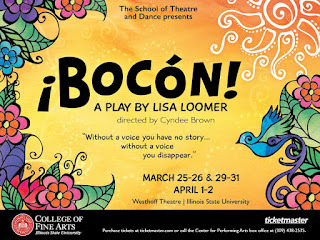 Illinois State University's Department of Theatre and Dance brings ¡Bocón! (The Big Mouth) by Lisa Loomer to Westhoff Theatre March 25 to 27, 29 to 31 and April 1 and 2. Dr. Cyndee Brown directs this "imaginative fable for the whole family, interweaving fantasy with the violent reality of the 1980s war in El Salvador." Although the show is intended for all ages, the issues involved are deep and real, as a boy named Miguel loses his parents to "enforced disappearance" for opposition to the political regime. Miguel, too, is silenced, and he must take a long journey to find his voice and himself. Joshua Pennington plays Miguel in this production, with Daniel Esquivel, Vanessa Garcia, Johanna Kerber, Natalie Kozelka, Gabrielle Muñoz, Samantha Peroutka, Thomas Russell and Nick Scott in the ensemble. Those are the events that rose to the top of my list, but I'll have more about the Normal Theater and its Hitchcock/Truffaut pairings, the University of Illinois's Grapes of Wrath and In the Blood, and whatever else crosses my desk. *The story goes that the original 1960 Little Shop of Horrors was made for about $25,000 while the 1982 musical movie was budgeted at about $25,000,000. That's 25 thou to 25 mil.